HotorNot is an app where you can rate pictures of other people and see how others rate you. It's free to rate pictures and send messages (provided you have an approved photo). There's also paid memberships which grant extra privileges such as appearing higher in searches, and unrestricted messaging. Encounters lets you rate people and maybe get hitched at the same time. It's simple format of rating photos is both fun and addictive. The app is much different than that of conventional online dating sites in that there are no extensive profiles to fill out. You merely need to fill out a short form and upload a photo. That's about it. Public photos must be approved by the site's moderators. Photos will then be rated by other members on the website by clicking a heart or a cross. You can start rating people on the site for free without registering - but only a limited a number before you are prompted to join up. After voting the official rating of the person appears in a box on the left. This is based on all of the votes collected. A system in place requires mutual consent between members in order for any communication to occur. A basic membership allows you to send and receive unlimited matches and messages. A paid monthly subscription allows you to navigate the site ad free site and also appear before free members in search results. Paid members also get access to other members' naughty photos. The app is very popular and relies heavily on community participation. Their service is available for iPhone, Android as well as of course through the website. Hotornot.com was the brainchild of two entrepreneurs who have used the internet to launch a highly successful web dating service that is fun as well as affordable. Rss Feeds. Subscribe to comments for this site. [?] 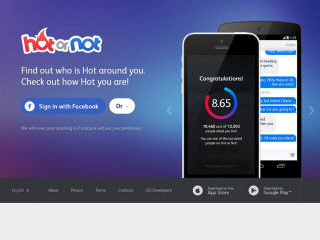 Receive updates about Hotornot.com directly through your newsreader. I love it! i love those who love me. hi my name is rich i'm 46 years old never been married hoping to meet fun attractive women to have fun with. HotorNot.com 3.75 4 A review of HotorNot.com. HotorNot is an app where you can rate pictures of other people and see how others rate you. It's free to rate pictures and send messages (provided you have an approved photo).